This Cheesy Lemon Chicken with Bruschetta Topping is the perfect introduction into spring! 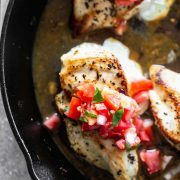 Tender marinated chicken breasts are seared in a cast-iron skillet, stuffed with gooey mozzarella cheese, and finished off in the oven. They’re served with an easy white wine and lemon pan sauce, a fresh tomato topping and plenty of chopped basil. We are MAJORLY into easy chicken dinners in our household, and even though I know you could eat today’s recipe every single day and be happy, don’t forget to check out this Creamy Lemon & Mushroom Chicken, this Crispy Sheet Pan Chicken Parmesan, and this Five Ingredient Sage Butter (Faux) Roasted Chicken. 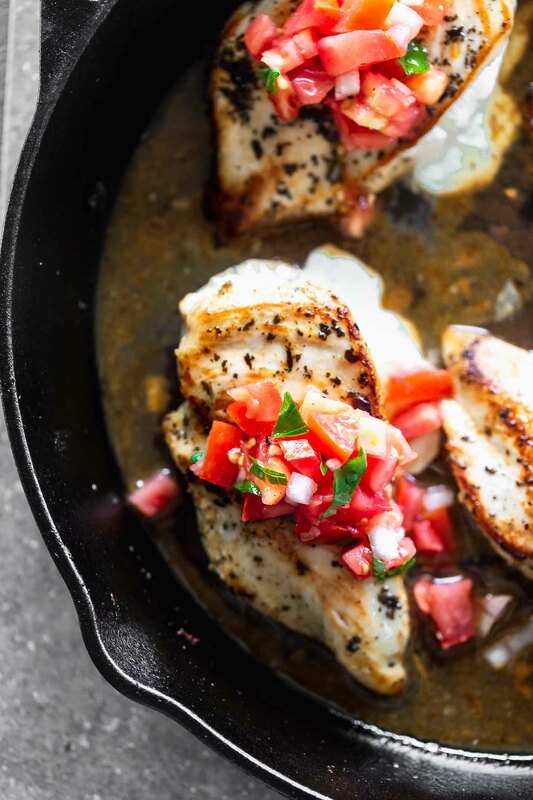 If easy, flavorful one-skillet dinners are something you fancy (Why wouldn’t you? ), then today’s recipe is practically guaranteed to go directly into your go-to recipe files for many years to come. 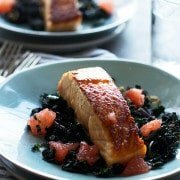 With a majority of the prep time hands-off, and the actual babysitting cook time very minimal, it’s also a dinner very friendly to busy weeknights. Prep the marinade and tomatoes in the morning, let the chicken soak it up over the course of the day, and then quickly throw everything together in about 30 minutes in the evening. Because the title alone can’t adequately describe the ins and outs of today’s recipe, here’s a brief synopsis: Tender chicken breasts are marinated very simply in lemon, garlic, and olive oil. You can let the chicken marinate all day while you’re at work, or for as little as one hour if you didn’t prep that far in advance. 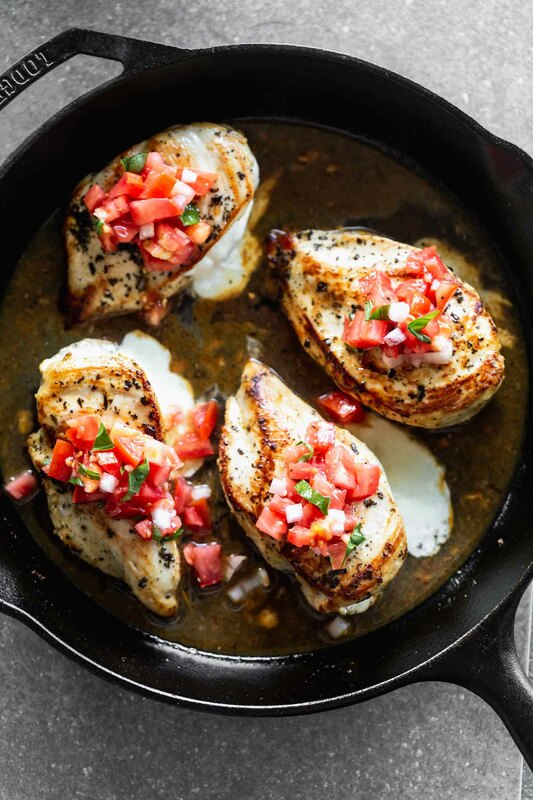 Each chicken breast is cut in half partially through, seared in a cast-iron skillet and then stuffed with fresh mozzarella cheese. 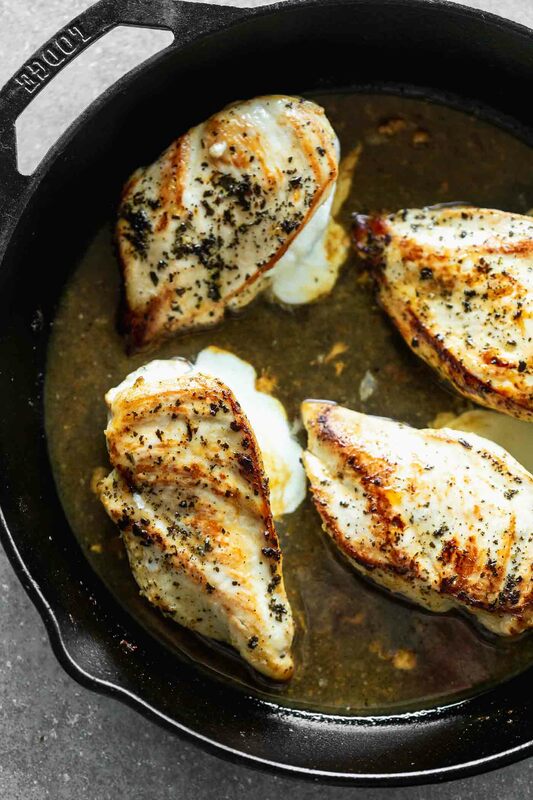 A splash of white wine and lemon juice goes in, and the whole skillet is popped into the oven to finish cooking the chicken and melt the cheese. Once it comes out, you top it with a generous amount of bruschetta topping (tomatoes, garlic, olive oil, salt, pepper, and basil), and an extra sprinkling of salt and pepper. Cut a pocket in the chicken lengthwise, but don’t cut all the way through! Add lemon juice, grated garlic, dried basil, and olive oil to a large zip lock bag. Add four chicken breasts. Let the chicken marinade for at least one hour and up to eight hours. Dry the chicken off and sprinkle with salt, pepper and more dried basil. Stuff the chicken with mozzarella, then add white wine, lemon juice and a little bit more salt. Transfer the skillet to the oven and bake until the chicken is cooked through, and the cheese has melted, another 10 minutes or so. Transfer the chicken to a platter, spoon the sauce over the breasts, and top with tomatoes. Drizzle with a little bit of olive oil! What can you do ahead of time? 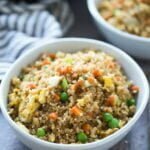 Since chicken does dry out really easily, I really don’t recommend making this dish from start to finish from scratch. Instead I like to marinate the chicken in advance (you can do this overnight if you want). I also like to make the tomato topping in advance, and honestly, the longer it sits, the better it gets! Swap out the mozzarella for blue cheese, burrata, or gruyere. Really, anything works as long as it can melt. 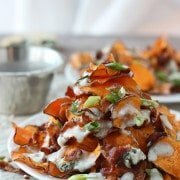 Boursin or goat cheese will also work wonderfully. If you don’t have white balsamic or sherry vinegar, balsamic will work just fine. If your tomatoes aren’t very ripe, be sure to give them enough time to sit in the liquid. The longer they sit, the juicer and more tender they will get! Use a white wine you’ll drink. Anything dry is great! Dried thyme, oregano or herbs de Provence will work in place of basil. Don’t buy colossal portions of chicken. A small breast will work best. This One Pot Creamy Orzo is a side favorite! One pan, 15 or so minutes, so good. 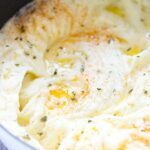 Creamy Dreamy Mashed Potatoes. To soak up all the pan sauce! Everyday Kale and Brussels Sprout Salad. Use a sharp pairing knife to cut a pocket lengthwise into the chicken. Add 1/4 cup lemon juice, 3 garlic cloves, and 1/4 cup olive oil to a large ziplock bag. Add chicken and massage into flesh. Marinated for at least one hour, but no longer than 8 hours. Preheat oven to 375 degrees. Once the chicken has marinated, pat dry with paper towels. Season liberally with salt. Sprinkle evenly with dried basil. Heat a large cast-iron skillet to a medium heat. Add 2 tablespoons oil. Once the oil is hot, add chicken. Sear until golden brown, about 3-4 minutes on each side. Once the chicken is seared, remove from the pan and onto a plate. 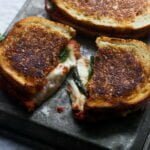 Gently put a few slices of mozzarella into the pocket. Add white wine to the pan and use a wooden spoon to scrape up all the brown bits. Add remaining 2 tablespoons lemon juice. Remove the pan from the heat and add chicken back. Place in the oven and bake until chicken is cooked through and cheese is gooey and melted, another 7-8 minutes. While the chicken bakes, add tomato, shallot, vinegar, fresh basil, 1/4 tsp salt, remaining 2 teaspoons olive oil, and 1 garlic clove to a bowl. Toss to combine. Season with salt and pepper. To serve: Plate chicken and spoon sauce on top. Top with bruschetta topping. I also like to sprinkle a little bit of flaked sea salt and black pepper on top. 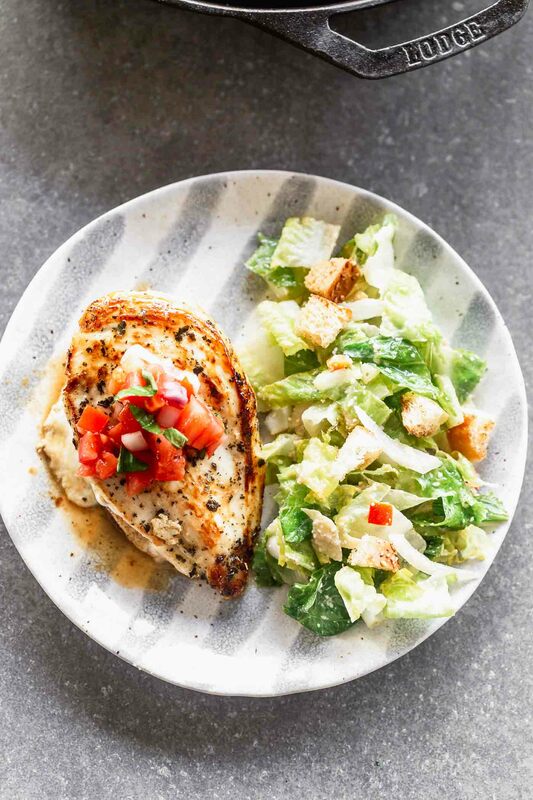 5 Responses to "Cheesy Lemon Chicken with Bruschetta Topping"
Can’t wait to try this! Pinning! Made this for supper tonight and it was very good. I have a couple of questions. At what temperature do you bake it? I used 350, but it took extra time to bake. Also, 1/2 cup dry white wine, divided. Where is it used twice? Recipe just says add white wine to pan and scrape up brown bits. Was it to be used as part of the marinade? 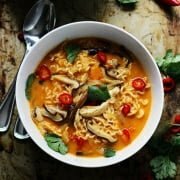 The flavors were delicious and I want to make this again.